Having already visited the West 4th location, I had an idea what to expect. That also meant I was going to order something different than last time. 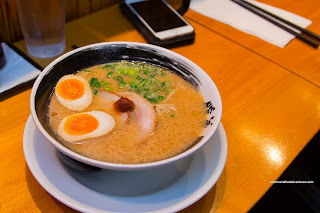 So I decided on the Classic Tonkotsu Ramen with thin noodles, standard broth and chashu. Although small in size, the bowl was just enough for our purposes. The noodles were chewy despite being thin while the soup base was slightly silky with a creamy fattiness. Flavours were meaty and marginally salty, yet interrupted by the added spicy condiment. 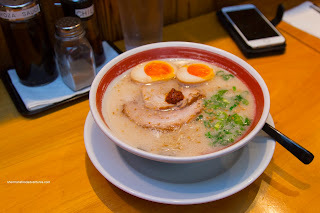 I enjoyed the chashu as it was sliced thin and practically melted into the soup. Emily opted for the Shio which was somewhat similar to my order except with more body due to the concentrated salt content. I wouldn't classify it as salty, but it was more impactful. 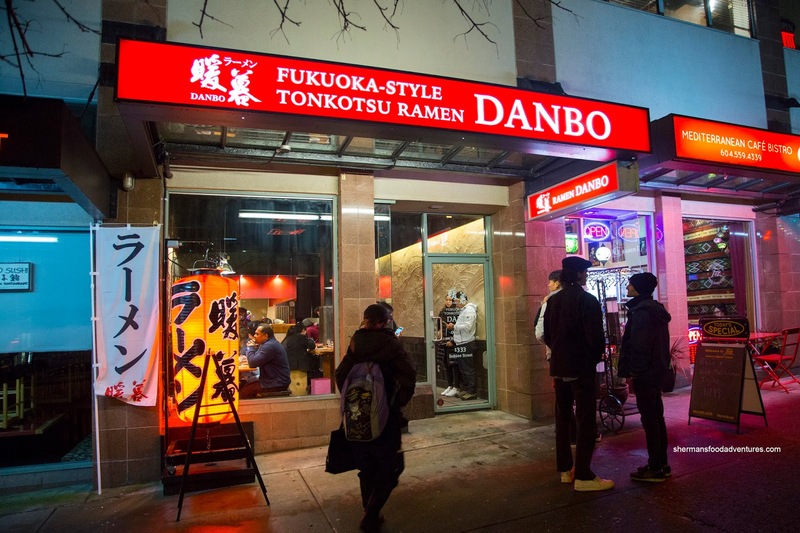 This was also partially due to her preference for fatty broth and fattier chashu. 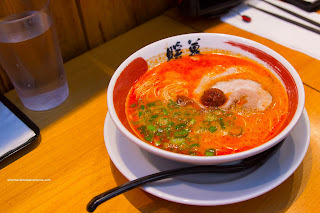 Diana went for spicy in the Blazing Hot Rekka Ramen which featured more of the Ichimi togarashi red pepper. Hence, the broth was definitely spicy. However, the spiciness came though in layers and lingered. We also shared an order of Gyoza which was fried up nice and brown on the bottom. It was crunchy while the rest of the dumpling wrapper was thin. Inside, the meat was moist and not inundated with too much cabbage and scallion. 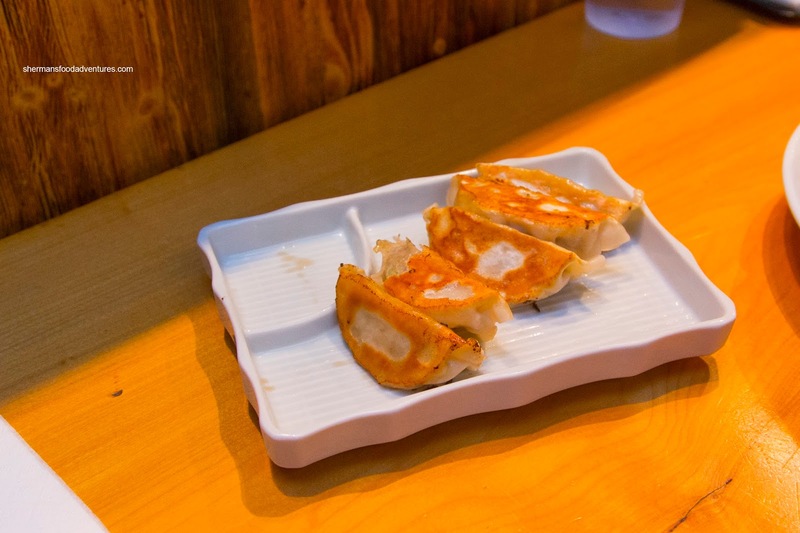 The supplied gyoza sauce and chili oil at the table afforded the opportunity to adjust the flavours. 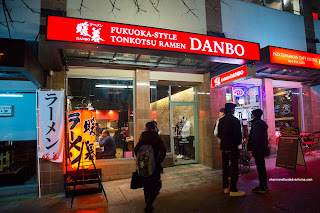 Interestingly, after we were done, I concluded that I enjoyed this visit to Danbo more than the first at their West 4th location. Was it psychological or was it actually better? Not sure, but I'd come back.